A Pretty Seam for This Crochet Cowl! Instead of trying to hide a seam, turn it into a bold beautiful statement. 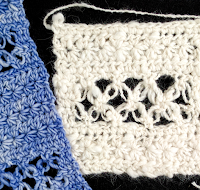 There are many ways to seam crochet, whether you slip stitch or single crochet the edges together, or you sew it with a yarn needle. Depending on the edges to be seamed, seaming them together unobtrusively may be impossible—no matter how many different seaming methods you try. Neck Warmer? 'Seams' Even Trickier! For my newest cowl, the Burly Bias, I didn't even attempt an invisible seam, for two reasons. First, the seam would most often be worn to the front, as you see above. Yikes. Second, the stitches are going in two different directions. One edge is along the ends of rows. Normally this is great with Tunisian crochet. Tunisian row ends have a naturally seam-ready chained edge (especially when you do #4 in this list). The other edge is one complete row (NOT along the ends of rows). In other words, the stitches in the two edges to be seamed are at right angles to each other. They're perpendicular. Here it is worn sort of sideways. 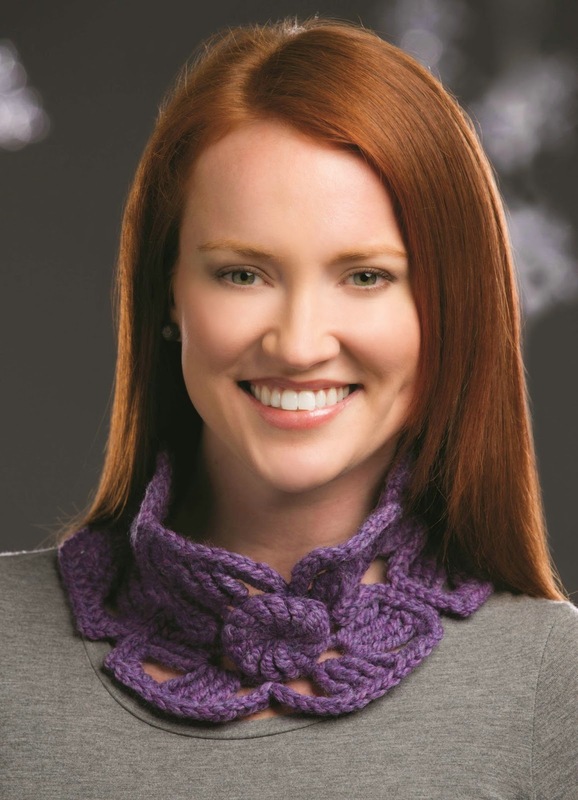 This seaming situation is really common with the type of cowl called a neck warmer. Slip Tectonics is a great example. Do you love it? 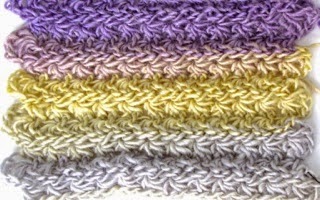 I'm so glad I used a soft long-striping yarn so that I could pull out a color to use for the star stitch seam. Now to do this with all the neck warming things! 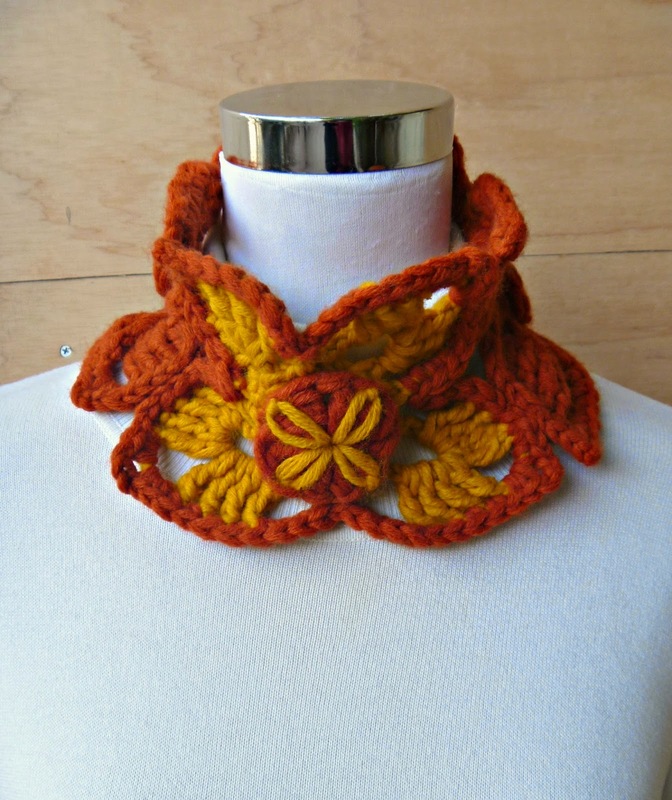 My newest cowl design is Lovelace. 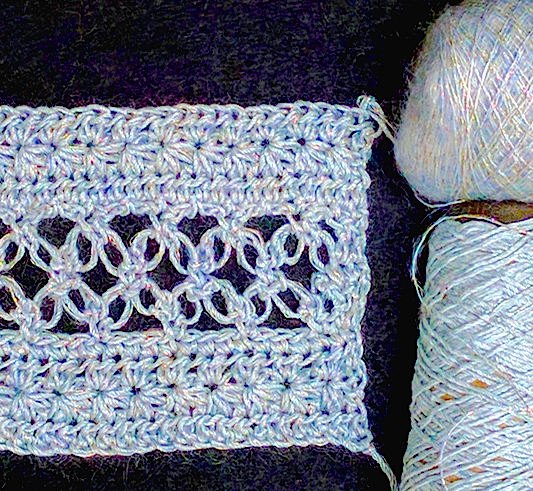 I have wanted to crochet two fancy, historic stitches together in one pattern for a long time! I wonder if it has ever been done before. I think of Lovelace as uniting north and south. This is based on all the research I did into the history of these stitches. just like in old Norway! Both originated in the mid-1800's. I can trace star stitches back to Norway, where warm wool yarns were used. Even though some of the earliest star stitches were lacy, they were crocheted with wool, not a cotton or silk crochet thread. Meanwhile, the lover's knot (a.k.a. 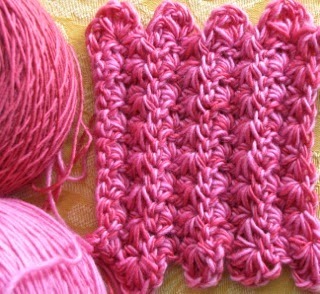 Solomon's knot, or simply knot stitch) was always crocheted with crochet thread, and the finer the better! So delicate and lacy—so summery—that from a distance the strands appear to dissolve in the sunlight. with a strand of glittery mohair. Love knots are perfectly happy to be crocheted of yarn too, even wool. For Lovelace I used a medium (worsted weight) merino wool yarn, and swatched many others, which all worked beautifully. Lovelace swatched in handspun angora! Crocheting these two together is a fun and exciting Intermediate skill-level experience. It makes a truly special gift. Make it as long or wide as you like; I included information for customizing the size in the pattern. "I wanted to design a Christmas gift, decided on a crocheted scarf. Began experimenting with colors and textures of my yarn remnants and worked various prototypes that could be easily written as a pattern. Result was the Cowl for Skerin Four Ways." The pattern also calls for four buttons, which is a fun exercise in itself to go through the button box and pick out the “just” right accent of color/textures of buttons to put the cherry on top of this delicious yummy item. 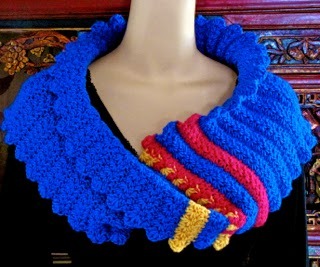 Susan said the response to this scarf was "absolutely overwhelming"! All kinds of texture goin’ on in a soft and warm cowl; completed in multiple textures and yarn weights and lots of fun choosing the just-right buttons to set it off! Makes up really fast; excitement builds as each new color and texture are added. Work seems to go faster and faster as each row is completed … and you can’t wait to see what the next completed row brings! Skill Level: Easy. Of yarn weights in yarn standards categories 4, 5, and 6. Finished size: approx. 32”x6”. Crocheting star stitches that look this lacy has been a fun discovery! Earlier this year I was preparing to teach a new crochet class on star stitches. 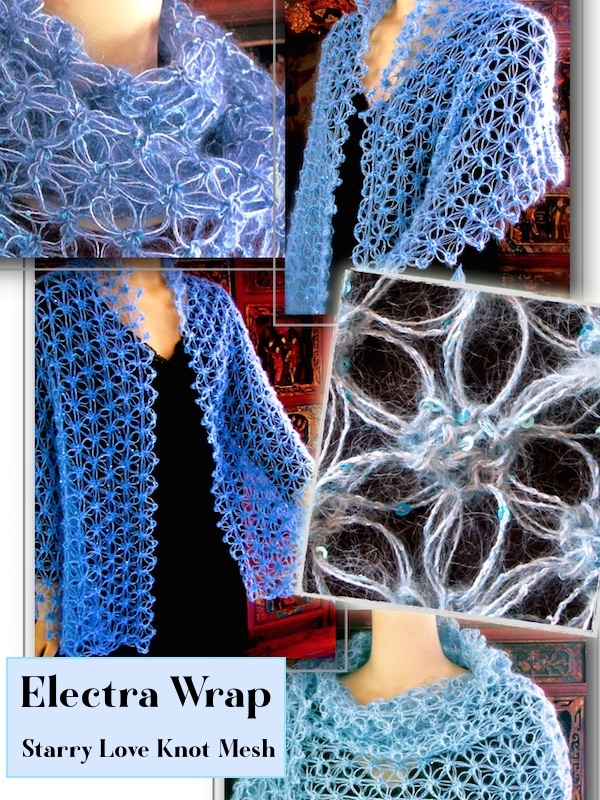 This is when I learned about the incredible lace textures star stitches can have. The Starwirbel Cowl came together quickly as a design for several reasons. With a big crochet hook, each star gets you where you want to go faster. I used a yarn that has bitsy sequins here and there, with some mohair and silk. I couldn't put it down! It's crocheted in the round with no turning—that means it's a spiral. I love how you can really build up speed and momentum when crocheting in a spiral. I named it "Starwirbel" for this reason. the "wirbel" part is a German word for whirl. That's what the spiraling construction felt like to me while crocheting it. Before I found the term "wirbel" I was thinking of names like "Star Whirl" or "Star Funnel." I think "Starwirbel" is more distinctive and memorable. Also, I love that several German crocheters have purchased this pattern. This pattern is not free and I really appreciate each and every purchase of it. Starwirbel comes with a great photo tutorial. It also benefits from all the information I gleaned from the (frankly outrageous) amount of research I did on star stitches for my star stitch classes! 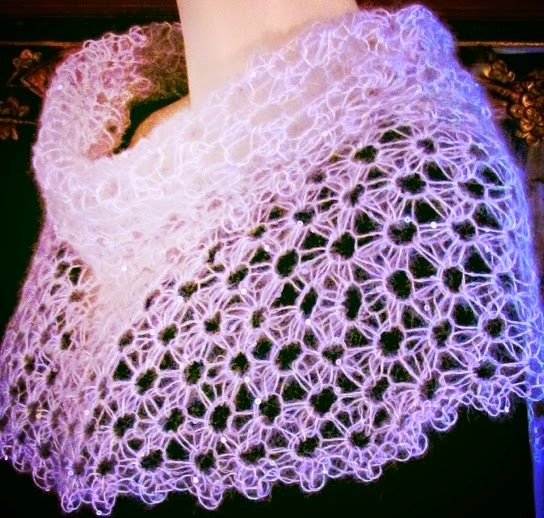 The En Fleur Cowl is my latest cowl design, and it is also the first time I have designed a project for Crochet! magazine! The bold floral motif inspired this cowl, and in addition to designing the magazine version, I wanted to find more ways to use/ alter the motif pattern. 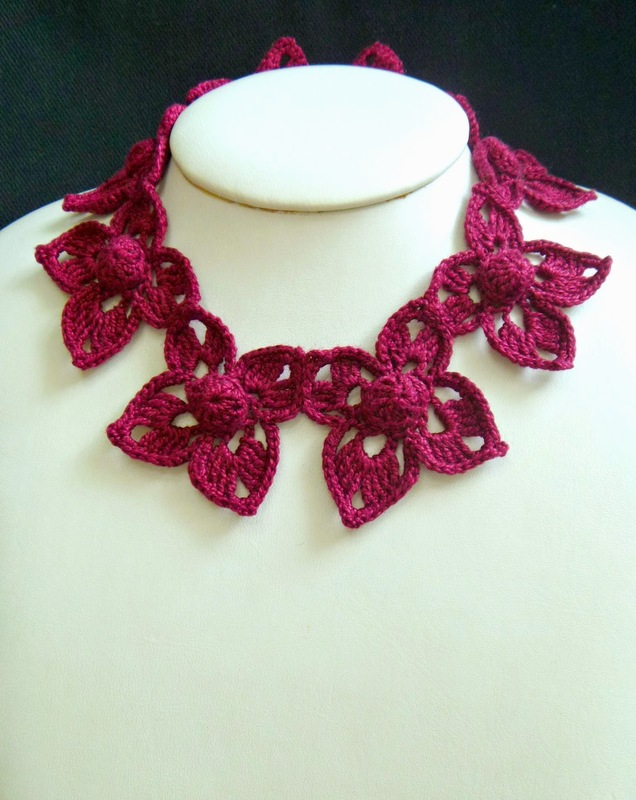 You can find instructions for how to alter the pattern in the magazine to make this necklace, on my blog. The stylists for the Crochet! magazine photo shoot came up with the idea to wear the cowl as a headband. I love the versatility of that. 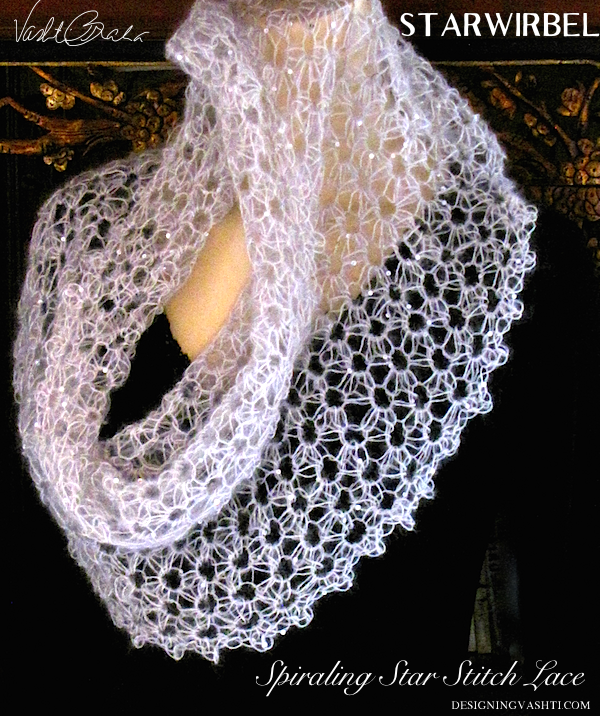 you could easily wear it as a cowl or a headband on the same day, depending on the weather or your mood! These are just a few ways you can have fun with a simple motif pattern- whether you change the colors, yarn, or the way you wear it, you can get a lot of mileage out of a pattern! Cowl crochet fever is back again! 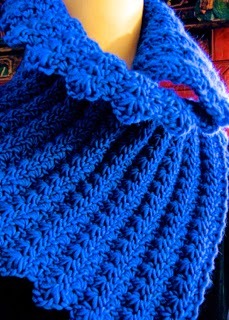 A larger Starlooper Mobius Cowl warms the shoulders. neckwarmer that overlaps in the front. 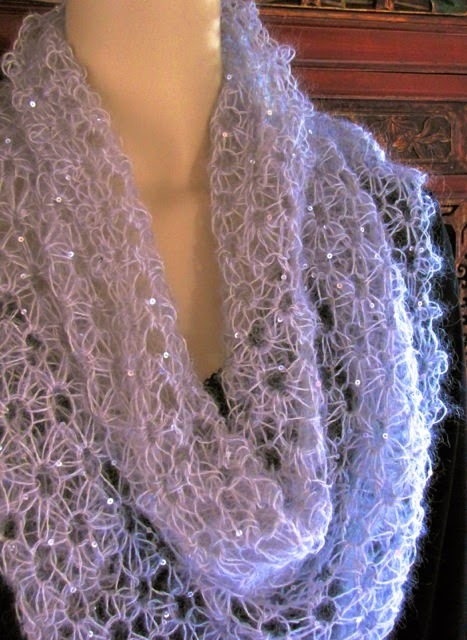 When I added a mobius twist to the Starlooper loop scarf, it multiplied the fun ways it drapes around the neck and shoulders. I created a whole "menu" of NINE looks or wearing options. I love how this cobalt blue merino wool yarn photographed! 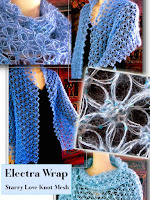 The star stitches are lovely no matter what but this soft Z-twisted merino yarn adds to the texture. Two more photos: the first shows the same Starlooper star stitch pattern in a color-shading yarn. yarn by Marks & Kattens. This last photo shows a strand of two different colors held together. 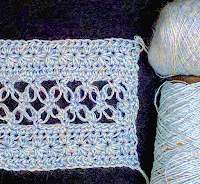 Starlooper star stitch pattern crocheted double-stranded. When I am working on a new design, I always keep my mind open to ways I could adapt the pattern to give it maximum versatility. 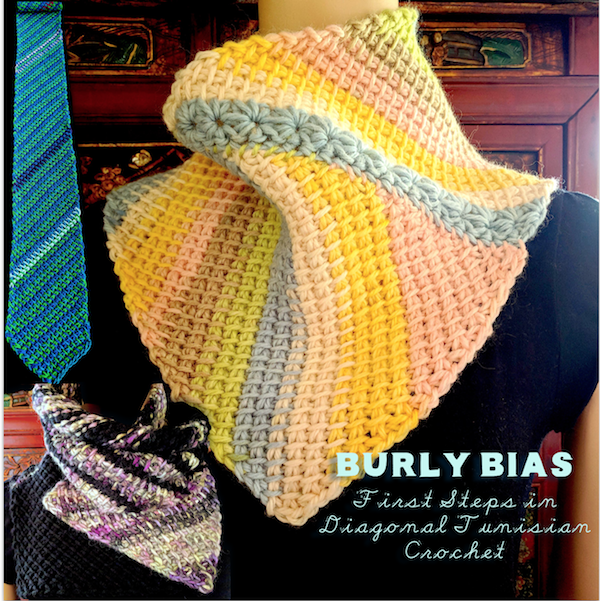 I think the Ruffles Scarf pattern I designed for Interweave Crochet's Fall issue, is one of my most versatile patterns to date. When I sent the finished sample to Interweave, I included photos of a dozen ways the scarf could be worn. It really looks very different depending on the way it is wrapped! Later, I got the idea to shorten the scarf to make it into a cowl, and I just had to make one! I love how the cowl turned out, and that it looks different enough from the scarf, but still has the same flavor. 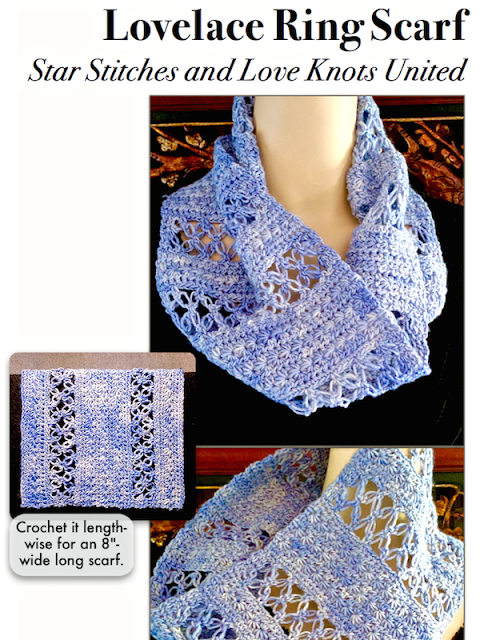 Chances are if you like the scarf pattern, you will like this too! 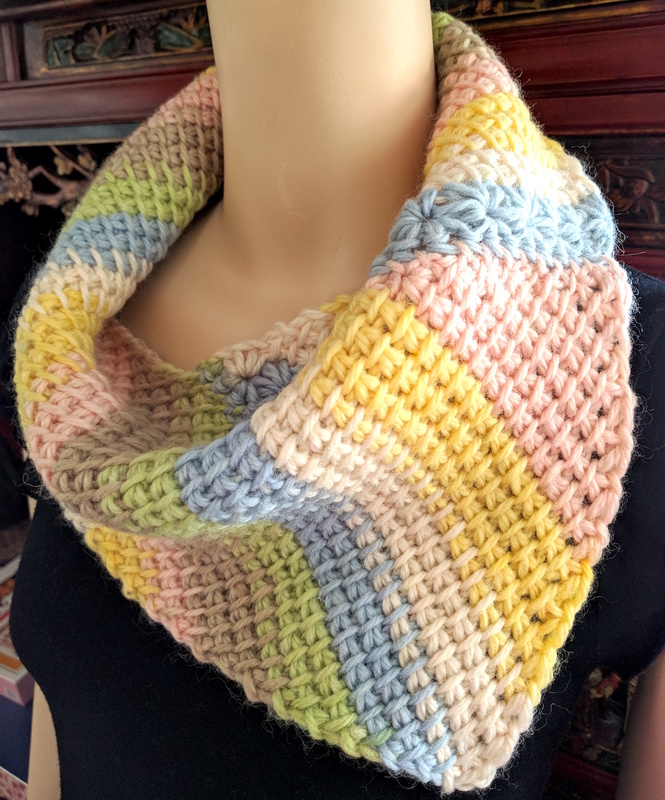 I have given instructions on my blog as to the alterations that need to be made to the original scarf pattern to make a cowl, and another version that includes some surface crochet embellishment. 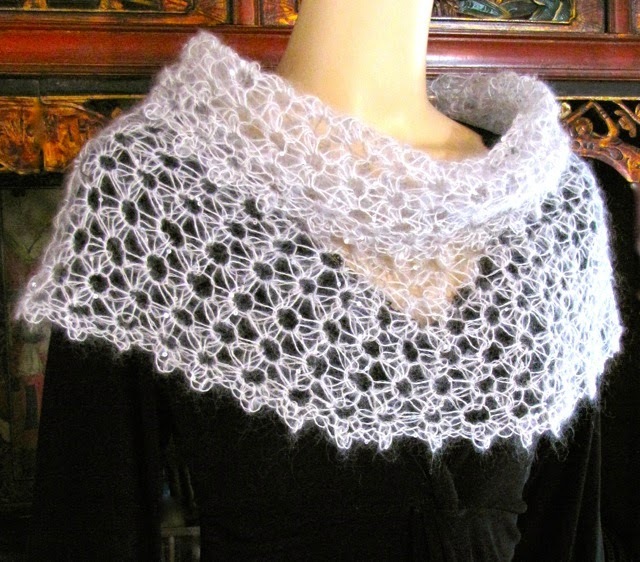 I am now curious about how other scarf patterns might transform into cowls! 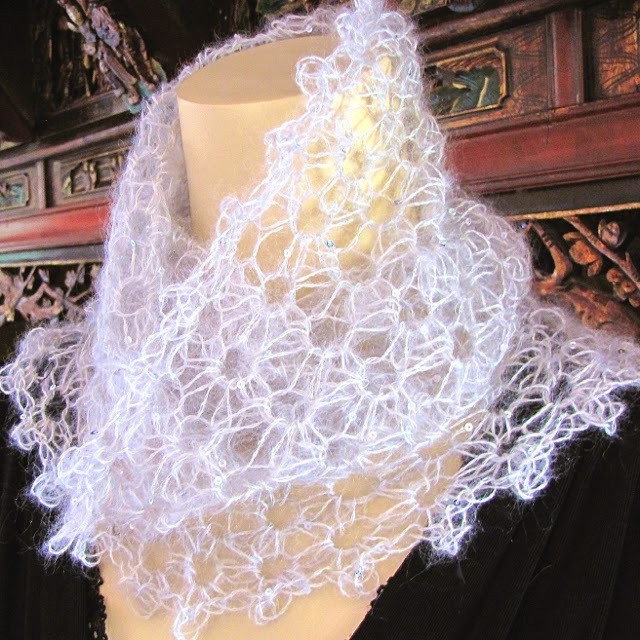 We're a team of professional crochet designers with a passion for designs that keep necks warm and cozy. This blog is for crocheters looking for inspiration and for designers with new crochet cowl patterns to share. The author of each blog post holds the copyright to all text and use of images within that post.. Picture Window theme. Powered by Blogger.